Yes, another book review! 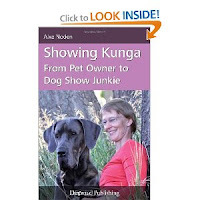 At only 124 pages, Showing Kunga: From Pet Owner to Dog Show Junkie is short but very informative. I really enjoyed this book, probably because showing dogs has always been a dream of mine. The author, Alxe Noden, wanted a blue great Dane. Worried about puppy mills and backyard breeders, she started researching the Internet. 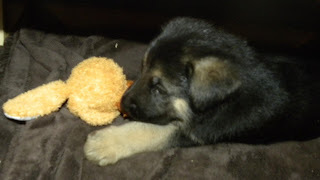 Alxe figured that a breeder who also shows would be more concerned with a puppy's health and temperament. The author felt that by choosing one of these puppies perhaps she could avoid some of the health problems often associated with great Danes. Once she got her puppy, Alxe joined a local great Dane dog club to learn more about the breed and hang out with other dog people. Hey, that's why I joined my dog club!! 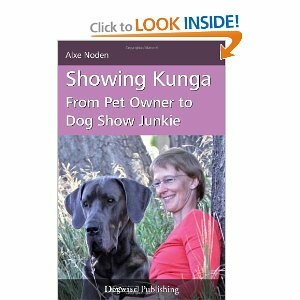 Alxe starting showing her dog for fun and got hooked. The author does a nice job sharing the ups and downs of showing from a newbie's point of view. I really liked how she articulated her reasoning for using a breeder instead of a breed rescue. This reminded me of an article I read a couple months back called Responsible Dog Breeders Are Rare, But I Found One and So Can You. I really liked this article. I have noticed that in Society's push to promote the rescue and adoption of homeless animals (of which I am a BIG proponent) it seems that all deliberate dog breeders have been vilified -- regardless of their intentions. Responsible breeders have been lumped in with puppy mills. This is so sad . . . and so wrong! 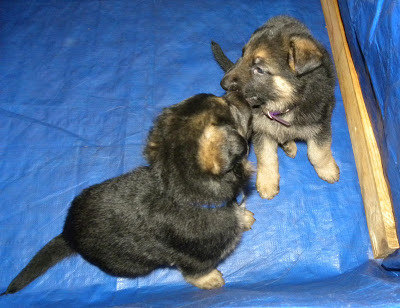 Another interesting article that discusses painting all breeders with the same broad brush is What I Learned at the Dog Show from Humane Watch. I stumbled upon this article when wrestling with my Puppy Pining last summer. I highly recommend both articles to everybody in the animal community. Spay, Neuter, Adopt -- Good. Puppy mills and indiscriminate breeding -- Bad. Not all breeders are the same; it's wrong to imply otherwise. Blue and Purple above, Yellow (I think) below. I love them all! What I find really fascinating is the changing attitudes towards breeding, and puppies. I think it points out the importance of researching and examining beliefs. Fifty years ago the puppies were basically left alone until their eyes were open, and sold at six weeks. I like the idea of responsible home breeders and hand-raised puppies. I would hope that new owners would either adopt that stringent protocol or not breed. For myself, I will always have mutts--we have so much in common!